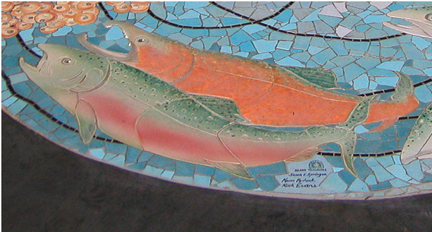 “The Life Cycle of the Salmon” was created and installed by Susan Springer and Illahe Tileworks, per specifications by the city of Portland. 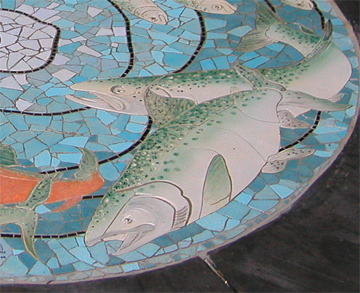 The brightly glazed ceramic tile mosaic depicts the physical changes undergone by the salmon as it makes its journey from river to sea and back again for spawning. 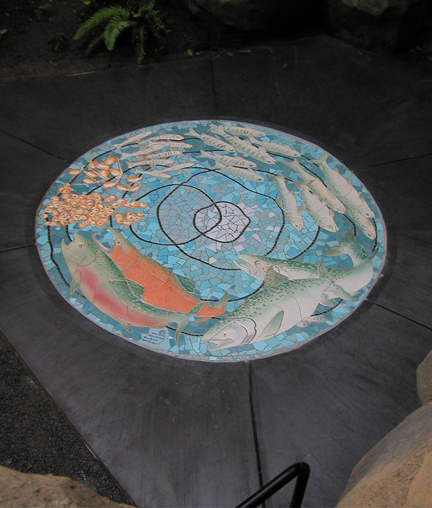 The mural measures roughly 7’ in diameter and is installed directly into the sidewalk of the Eagle Canyon exhibit, a 2004 addition to the spectacular Oregon Zoo. This is one of many successful site-specific art projects created by Illahe Tileworks.